As the use of closed-circuit television (CCTV) surveillance grows, so does demand for longer retention periods. This means a continual increase in requirements for surveillance footage storage. This is where Angani’s CCTV cloud storage solutions comes in. Our storage solution ensures protecting people and their property goes beyond crime observation by providing cloud services that improve file management. Cloud storage is a term used to describe the process of saving media files to remote storage systems accessed via the Internet in addition to or instead of saving them on a computer hard drive or a network video recorder (NVR). This has numerous advantages in comparison to saving all your surveillance videos on a NVR, including the ability to access your footage remotely and larger storage capacities. Why Should You Go for Cloud Storage? 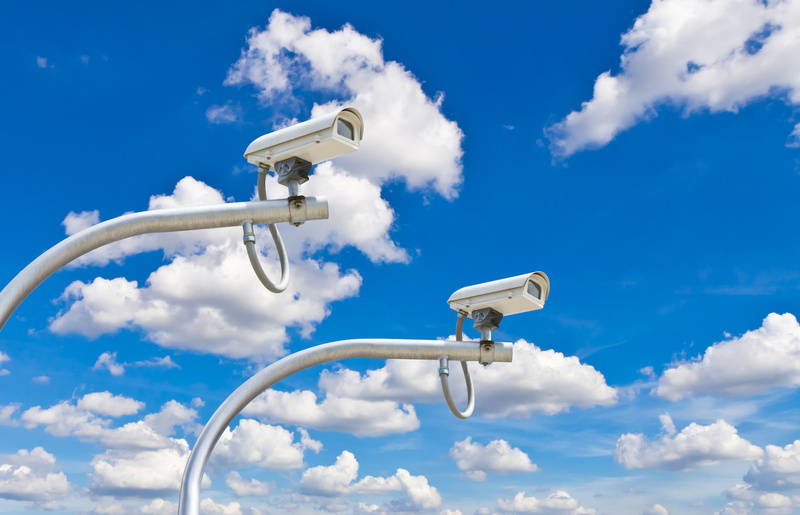 What are the Benefits of CCTV Cloud Storage? Data security is guaranteed if your hardware is stolen or damaged because your files are not stored locally. These are stored safely in our datacenters, away from any itchy fingers. When your CCTV storage requirements change, you can easily alter your existing storage plan by decreasing or increasing your storage and bandwidth as desired. With the elimination of need to purchase additional storage hardware, storing and managing your surveillance files becomes cost effective. Most companies prefer saving their security footage for longer periods, especially in cases where files contain potential evidence. Cloud storage makes it easier to store these files with larger storage capacity. Cloud storage provides you with easy remote access to your files. You can access your CCTV footage real time or at a later time using your device of choice. 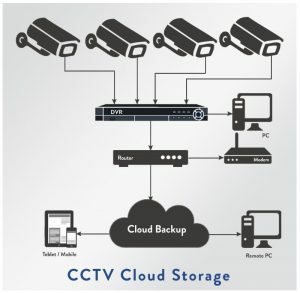 How Does the CCTV Cloud Storage Solution Work? IP cameras and video surveillance systems have DVRs and NVRs that are designed to work with cloud storage. These function like ordinary cameras but the information picked by the camera is converted into data that is transferred over the Internet, hence the name IP (Internet Protocol). This signal is sent to your broadband router where the audio and video information picked by the camera is uploaded over the Internet to our secure servers. Once your files are uploaded to the servers, all you need is Internet access and a laptop, PC or smartphone to access your files. Scheduling your video uploads allows you to choose the best time to upload your files with minimal impact on your network. You can schedule your uploads for early mornings, weekends, nights or the time that works best for your company. To enjoy the perks of CCTV storage and management solutions, consider having a video management system (VMS) in place. A VMS can be part of the software component of a NVR, even though it can be more sophisticates to provide more capabilities than a packaged NVR. With technology improvements, distinguishing between in-built features of IP cameras and a VMS is important. Many cameras provide internal capabilities for recording and viewing videos directly via web browsers without a VMS. However, the web interface that any given camera has is exclusive to that specific camera and might not allow shared access. Instead of recording data continuously, a VMS can implement motion detection to ensure that only footage with movement is stored, thus minimizing the amount of data to be stored. Audio can be recorded from network cameras using a VMS, and in some cases, two-way audio capabilities can be provided through network cameras acting as intercoms. A VMS can provide a single management interface allowing you to access camera sources from different serve devices, which makes your security footage appear unified and not isolated on many independent sources. Your alarm inputs can be monitored by a VMS, which then acts upon them. The VMS can send alert messages via cellphones, email or to a client’s mobile phone application. Our affordable and easy-to-use CCTV storage solution, lets you store your surveillance footage in the cloud to access at will. For custom cloud services unique to your surveillance needs, contact us now! « The Virtual Office – How Can it Improve Your Business Corporate Image?